Friday, August 8, 2008: Derry, New Hampshire – HomeAdditionPlus.com introduces its Room Addition Bid Sheet. The Room Addition Bid Sheet arms homeowners with the critical knowledge and information necessary to properly plan and have constructed a new home addition. A key element of the bid sheet is an extensive questionnaire that homeowners provide to prospective general contractors for bidding the project. The bid sheet also includes a separate project cost spreadsheet that homeowners can use to enter estimated and actual material, labor, and/or subcontractor costs for every phase of the home addition project. The Room Addition Bid Sheet is ideal for homeowners who are contemplating or planning to build an addition such as a family room. The Bid Sheet is specifically designed to help homeowners in the soliciting of bid proposals from general contractors. The 29 page, bid sheet includes a request for proposal (RFP) form that the homeowner submits to prospective general contractors for them to complete and provide back to the homeowner for review. The RFP form consists of over 160 detailed and specific questions on all aspects of building a room addition. 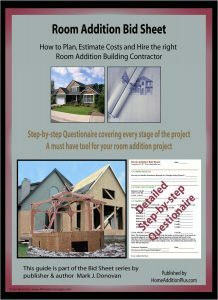 In addition, the Room Addition Bid Sheet provides extensive and critical advice to the homeowner on how to work with a general contractor and sub-contractors in order to ensure the room addition project is completed on time, on budget and to the satisfaction of the homeowner. It also includes an extensive list of manufacturers for key products associated with room additions. Specific Room Addition topics addressed in the bid sheet include: Excavation, Foundation, Rough Framing, Electric, Plumbing, Heating, Drywall, Insulation, Finished Carpentry, Flooring, Painting, Doors, Windows, Driveways and much more. In addition, it discusses Start and Complete Dates, and provides estimated time intervals to complete specific trade activities. It also addresses other topics such as Workman’s Compensation and Liability Insurance Coverage, Debris Disposal, Budget Allocations for Flooring and Appliances, Reference checks and estimated building costs and payment schedules. It also includes a separate Excel spreadsheet form for entering your own construction costs estimates and actual costs. The Room Addition Bid Sheet is priced at $17 and can be purchased on line at Room Addition Bid Sheet, and is immediately downloadable.